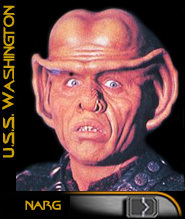 Being one of only a handful of Ferengi in Starfleet, Narg is faitly well known throughout Horizon Fleet. He is a world class negotiator and capable of obtaining nearly anything imaginable. This can sometimes get him into trouble as he has been cited for smuggling, on occasion, various illegal food items. Narg had a large finanical portfolio on Ferenginar but was exiled from the planet after he was charged with certain tax fraud violations against the more social state run by the Nagus Rom.